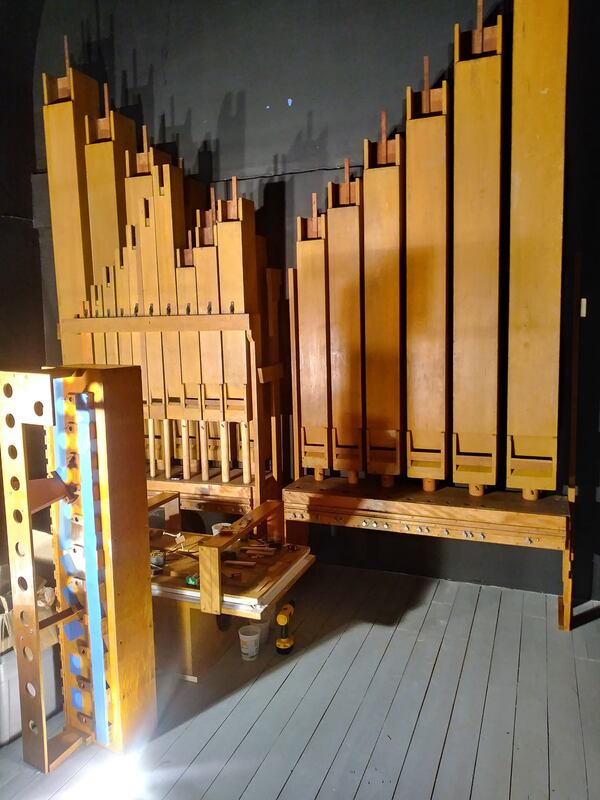 First Presbyterian Church of Stroudsburg, PA, received an organ from a church in Easton, PA, and has used its pieces to create a massive instrument that is being embraced by both the congregation and the community. That sound you’ll hear coming from Main Street in Stroudsburg, PA, on Sunday mornings will be coming through pipes from a pair of organs that have graced Presbyterian churches in the region for more than a combined 200 years. The goal is to not only continue to have those melodies belted out on a weekly basis but also create a space where the entire community can enjoy this unique instrument. First Presbyterian Church of Stroudsburg is in the midst of finishing up a two-year-long project that involves combining its 1926 Estey organ with a 1904 Steere organ that was housed in the building of the former Olivet Presbyterian Church in nearby Easton, PA. 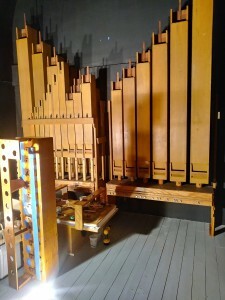 The combination of the two organs results in an instrument that now has 2,800 pipes and 42 ranks (sets of pipes), both of which are double the amount of what the Estey organ had at First Stroudsburg. The project, which is hoped to be completed by March 1 in plenty of time for Easter services, also includes a remodeling of the sanctuary. Not only will the organ console now be on wheels – allowing for the organist to be better seen during special performances – other chancel furnishing like the pulpit are now mobile as well. 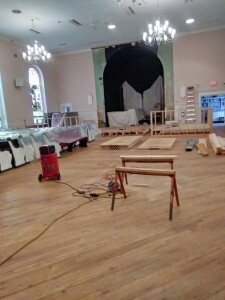 The pews have also been spread farther apart to allow for more leg room, and the carpet has been removed in order to expose the wooden floors, which makes for a better-sounding area. Community groups have been using the sanctuary at First Stroudsburg for their annual concerts, and that interest will only be greater now with the upgrade of the church’s organ. Having even more people wanting to perform there and become acquainted with the congregation is certainly an underlying goal of this project. A renovation project that includes a widening of the pews and removal of carpet is taking place at First Stroudsburg. The congregation has dreams of some unique musical performances eventually coming to First Stroudsburg. The inaugural concert with the new organ will occur on June 21. It will feature renowned organist Bruce Neswick, a performance that will be offered free thanks to a congregational bequest and a community arts grant. Beyond that, the church musicians have envisioned a Halloween-themed program that coincides with the town’s merchants’ trick-or-treat event where some holiday appropriate music – like scores from the Phantom of the Opera – would be played. Stroudsfest is a Labor Day weekend event that could be a time when mini organ concerts are performed in the sanctuary. They have also played with the possibility of the organ as part of a silent movie festival at the church. Another idea is to initiate an “Up and Coming Series” that would invite organists from other parts of the country to travel to the Poconos to help make a name for themselves on the concert series. Beth’s vision includes the musicians staying with church members for a week of vacationing in the Poconos as part of the experience. None of this would have been possible had it not been for a time of sharing that occurred at a Lehigh Presbytery meeting. There, it was announced that the Olivet Church was closing, and the building would be sold. Inside the building was the 110-year-old Steere organ that would be available. Combining organs is a long shot, but the church explored the possibility. The two organs and the space were compatible, and the decision was made to move forward. The construction began in 2017, making it a two-year project. Last summer during the building of the organ and renovation of the sanctuary, the congregation met for Sunday worship in the Fellowship Hall, but it has since returned to the sanctuary. Not only were the worshipers able to easily adjust to the situation, they also dug deep into their pockets to help fund the project. At a cost of $370,000, the congregation – which numbers around just 70 on a given Sunday morning – was able to pledge $140,000 toward the construction. Community donations and fundraisers are helping pay for the remainder of the cost. One member, Russ Cramer, is helping to spearhead a community fundraising campaign called “A Mighty Voice in the Poconos” in honor and memory of his parents, who also attended First Stroudsburg. “Our vision of this is that it becomes a community instrument,” said Beth, who is also the stated clerk for Lehigh Presbytery beginning in 2019. “We have invited the Stroudsburg community into the process and committed that we will make it available. For example, for students who would like to take organ at East Stroudsburg University, they can use our instrument to practice or play. Concerts, fundraisers, you name it and we will make it available to the community. The renovation project in the sanctuary is expected to be done in plenty of time for Easter services. It has been quite an undertaking for this community, the congregation and for Beth, who started what is her first pastoral call at First Stroudsburg at the exact same time the organ project began. However, this initiative hasn’t been a burden but instead something that has become extremely rewarding for everyone involved. “As a pastor called to this ministry of reimagination, as we all are in this time and space – and redevelopment and what’s next for the people of God and how are we the people of God in today’s climate – I would not ever have guessed it would be our organ to connect us to the community, but it is. It makes good sense: we’re a downtown church in a downtown that’s very vibrant. Note: The video that details the timeline and construction of the organ, as well as fundraising and other information, are available on the Mighty Voice website here.